With the competitive season looming, chiropractor Dr. Alexander Jimenez gives insights & examines the current best thinking on vaccination for athletes, and makes recommendations for sports clinicians. Without doubt, vaccination is one of the greatest triumphs of modern medicine. Many serious diseases that used to routinely maim or kill large numbers of people are no longer a threat. More than that, vaccination can prevent outbreaks of less serious illness, which although not life threatening, are still unpleasant, leading to missed time from work and school. Anyone with young children or who has travelled extensively abroad will (hopefully) understand that a programme of vaccination is either required or recommended. When it comes to the travelling athlete however, the situation is rather more complex. While the basic vaccinations (eg typhoid, hepatitis etc when travelling to certain regions of the tropics) are of course still required, clinicians will also want to ensure that their athletes stay as well as possible to compete at their full potential. A mild illness that is an inconvenience to a tourist may be a disaster for an athlete focusing on the peak of his/her season! 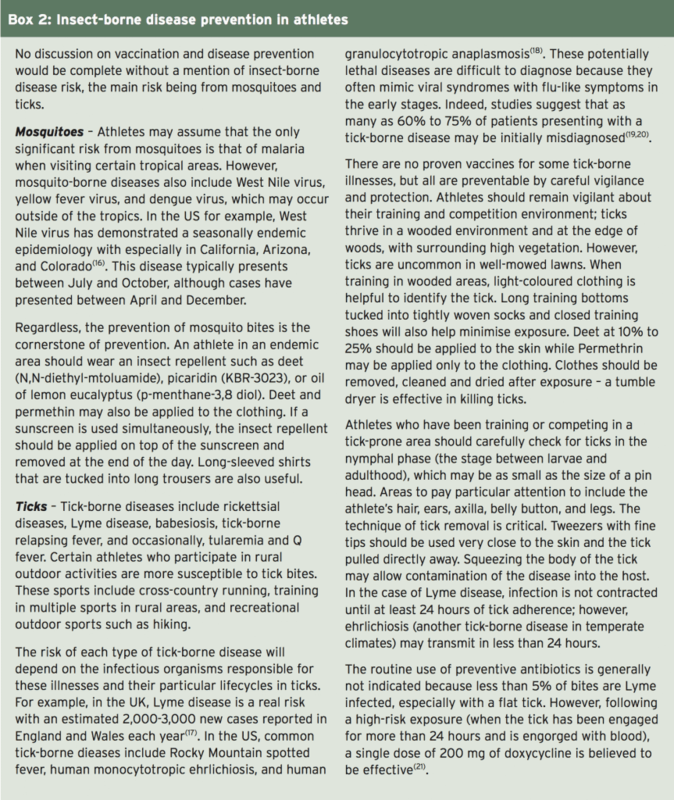 Sports clinicians may therefore wish to consider extra vaccinations to minimise the risk of more minor conditions. However, this approach raises a whole new set of issues. For example, which additional vaccinations may be use for athletes who regularly travel abroad? What are the possible side effects of these extra vaccinations and how should vaccines be timed to maximise immunity during the competition, while minimising disruption to training in the run up to competition? 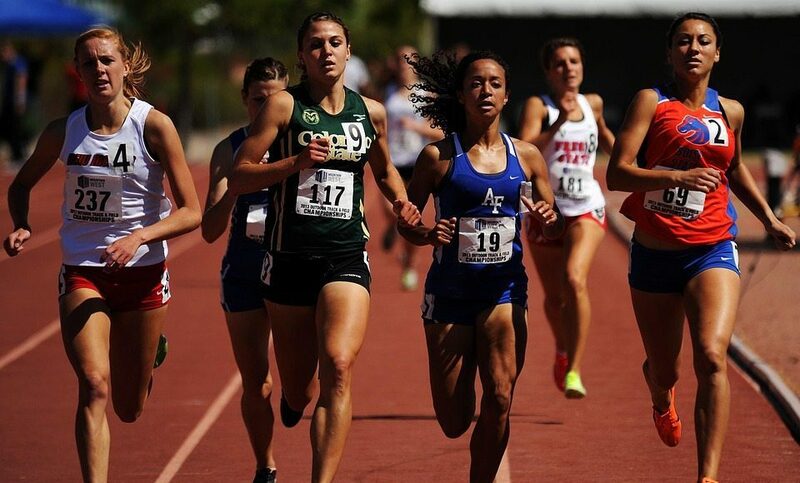 There exists some uncertainty about the most appropriate vaccination regimens in athletes among team doctors and other physicians because general public health vaccination guidelines cannot be easily transferred to elite athletes. Complicating factors include the typical circumstances of athletes’ daily life, such as frequent travelling to foreign countries or close contact with teammates and opponents, which might indicate the need for a modification of recommended vaccination schedules. In addition, intense physical activity of training and competition with its possible effects on the immune function can affect decisions about execution and timing of vaccination. Other complicating factors are that vaccination recommendations are formulated around a public health policy rather than for specific individuals and are likely to change over time(1-3). Also, there’s the issue of cost effectiveness; the majority of vaccines that are not generally recommended are not recommended because the medical benefit is not regarded sufficiently balanced with the costs if implemented across the whole population. This is despite the fact that they may be potentially beneficial in specific individuals(4,5). It’s also important to understand that generalised recommendations take no account of the implications of the effects of illness in athletes, which can be far more profound and far reaching than in the general public (see Box 1). 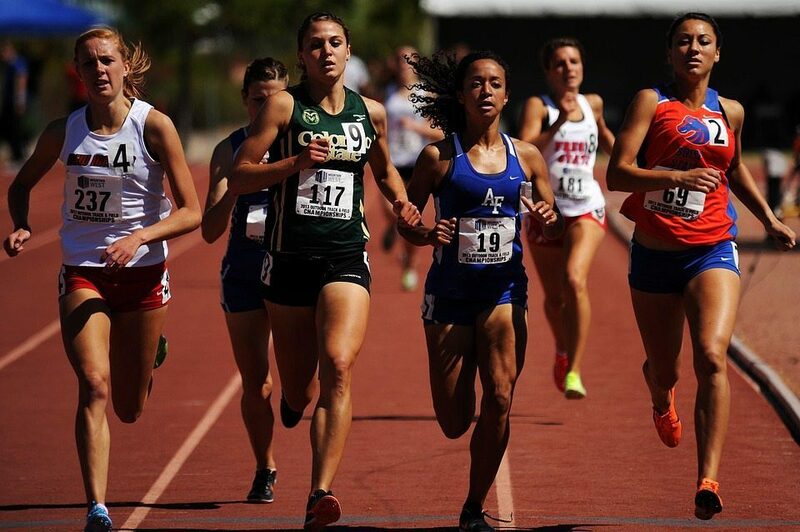 Athletes are often in close contact with opponents and teammates, which increases the risk of transmission of many diseases, particularly respiratory- transmitted diseases(9,10). Typically, a contact of less than 1-2 metres distance is necessary to transmit diseases such as influenza or other respiratory- transmissible agents such as varicella(11,12). For blood-borne diseases, the transmission risk due to sport is less pronounced but athletes are still at higher risk than the general population(13,14). Even healthy non-vaccinated athletes being exposed to an infectious agent (eg contact with a diseased individual) may have to be excluded from training and competition for medical reasons. Usually, such an exclusion has to last for the complete incubation period of a disease, which may be up to three weeks. Putting all these factors together, the recommendation is that elite, competitive athletes should be vaccinated more aggressively than the general public(15). Of these, numbers 1-5 should be given as inactivated vaccines while measles, mumps and varicella (chickenpox) should be given as live vaccines(15). 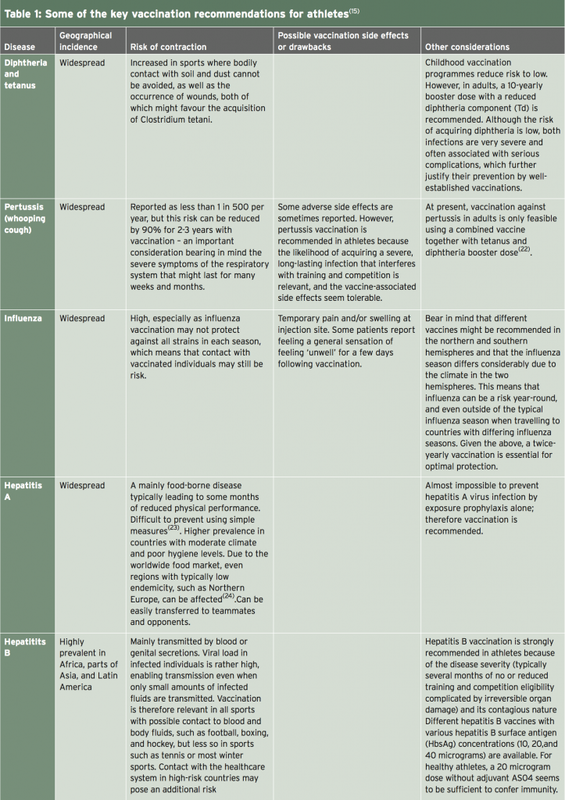 A full discussion on the detailed considerations regarding each and every possible vaccination is beyond the scope of this article (readers are directed to a full and recent review of this topic by Luke and D’Hemecourt(15)). However, Table 1 summarises most of the key recommendations. Timing of vaccinations should be chosen in order to minimise interference with training and competition, and to ensure the immune reaction is not temporarily impaired. Inactivated vaccines generally cause side effects within two days following vaccination. This is in contrast to live vaccinations where the peak of side effects is most likely to occur after 10-14 days when replication of the vaccines is at a maximum. Unless a vaccination needs to be administered urgently, the best time therefore for vaccination is at the onset of resting periods – for example at the beginning of the winter off season. When a vaccination has to be carried out within a training and/or competition period (eg influenza), there is no major medical problem with training undertaken shortly before or after vaccination. However, it is recommended to vaccinate shortly after a competition in order to make the period of time to the next competition as long as possible. Many vaccinations given via injection can cause local pain and inflammation at the injection site. Clinicians may therefore wish to time vaccine administration so as to not coincide with delayed onset muscle soreness (DOMS) following strenuous exercise. Dependent on the injection site, some sport- specific impairments may result (for example buttock pain in runners following a gluteal injection). Obviously, it is advisable to use the non-dominant side for injections in unilateral disciplines such as racquet sports. For vaccines that can be administered using either the intramuscular or the subcutaneous route, the intramuscular option seems to be preferable as it yields higher titer rate (more antibody production) and a lower risk of granuloma. Injection into the deltoid muscle is preferred if possible, although other muscle sites are possible. 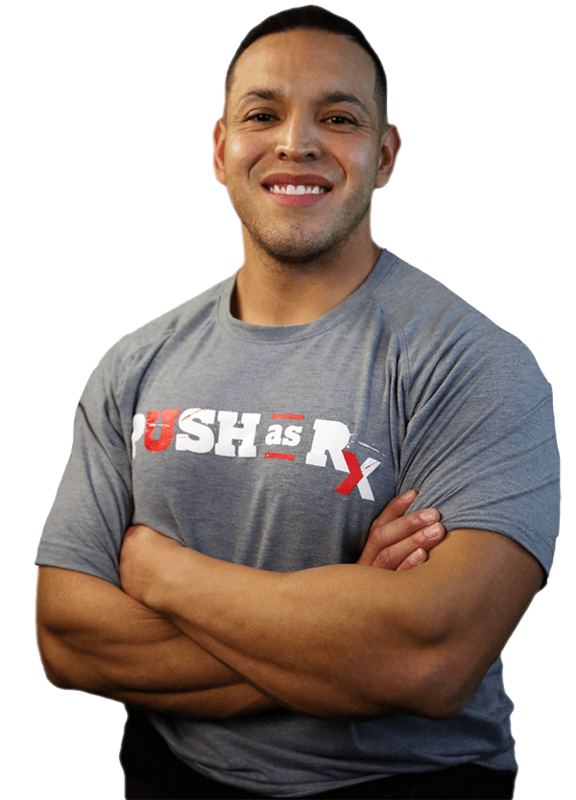 Regardless, it is important that the athlete is sitting or lying, and the muscle is completely relaxed. Studies indicate that the use of longer needles (25 mm) and a fast speed of injection/ withdrawal of the needle (1-2 seconds) are associated with less pain(37). Also, an angle of injection of 90 degrees may also help reduce pain in intramuscular injections. Syncopes or collapses following vaccination are uncommon but may occur; some studies on influenza vaccination suggest the frequency of syncope in younger athletes to be around 1%(38). However, the syncope itself may be less important than secondary injuries caused by the collapse such as skull fracture and cerebral haemorrhage. 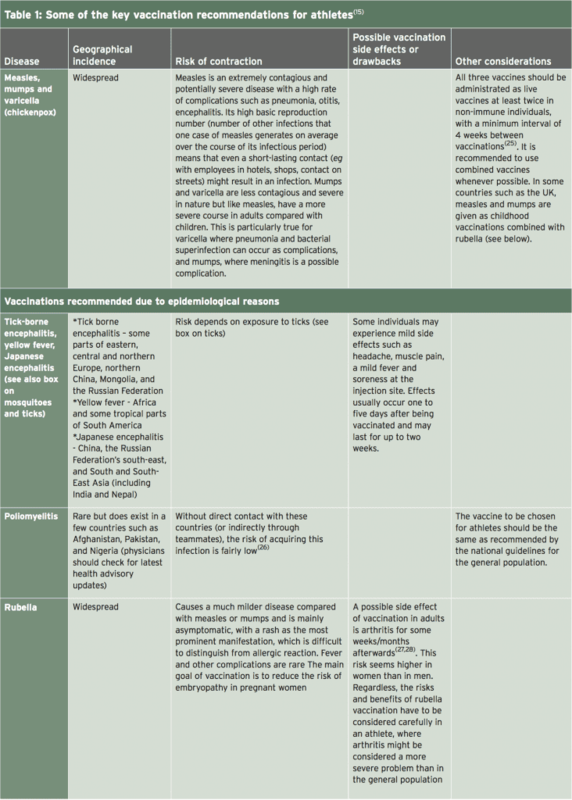 Given that the majority of syncopes (80 %) occur within 15 min of vaccine administration, it is recommended that athletes are observed for a period of 15-30 minutes following vaccination. This recommendation may be particularly important for endurance athletes because there are indications that, in these athletes, vasovagally-induced syncopes are more frequent(39). The recommended vaccination schedules for disease prevention will be dependent on the previous vaccination record and disease history of the athlete in question. Also, some schedules are dependent of the type/brand of vaccines used and recommendations may also differ according to public health policy in each country. Readers are directed to the summary given by Luke and D’Hemecour(15); there are also some excellent downloadable resources on the US Centre for Disease Control and Prevention (CDC) – https://www.cdc.gov/vaccines/ schedules/hcp/adult.html. 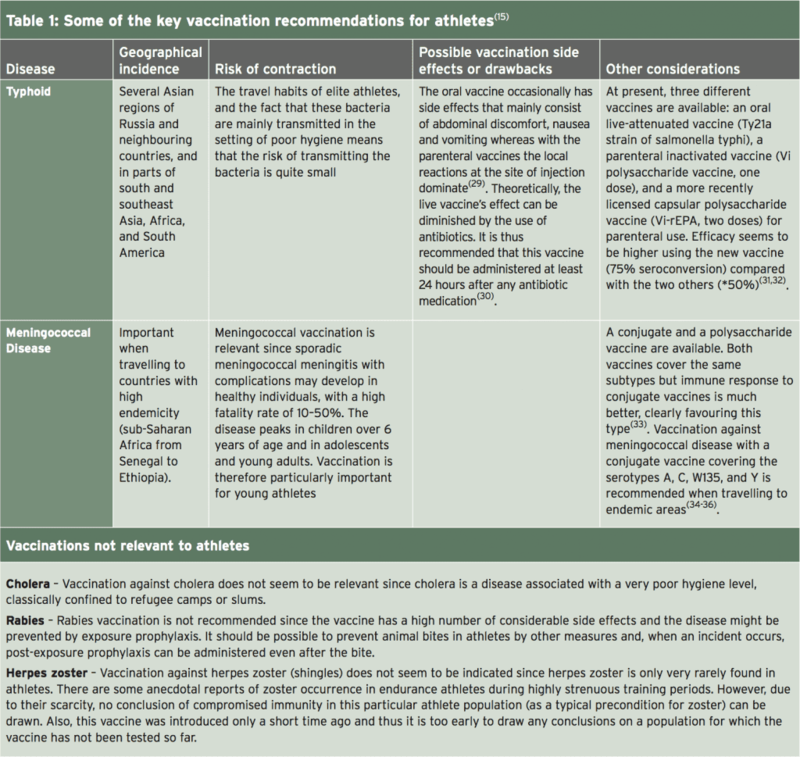 The vaccination requirements for elite athletes are not the same as that for the general public. 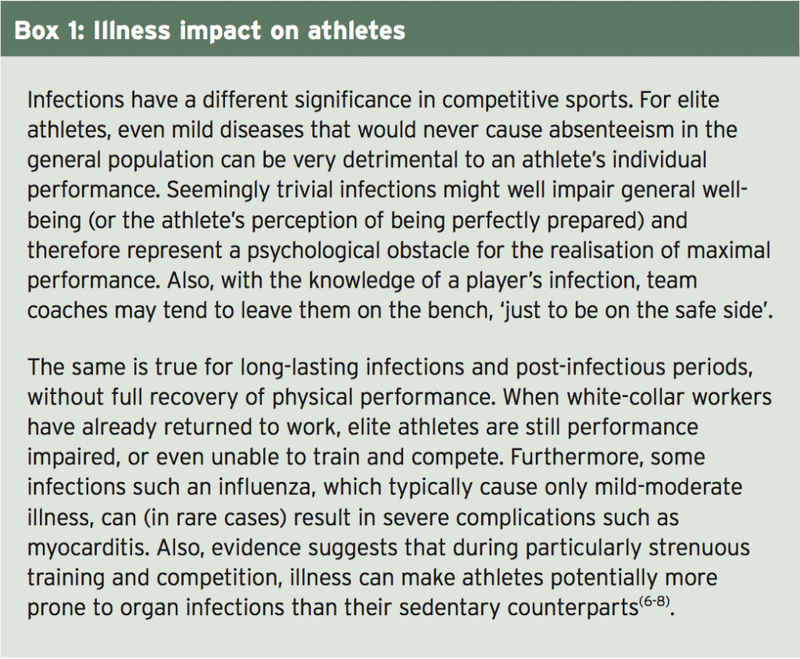 Not only are these athletes potentially exposed to more disease pathogens as a result of international travel, even the mildest episode of illness that would be barely noticeable to most of us can be devastating for elite athletic performance. For these reasons, sports clinicians and doctors should take a much more aggressive approach to vaccination of their athletes. Together with steps to reduce exposure and the correct vaccination techniques and timing, clinicians can maximise the potential of their athletes to perform at all times of year across all regions of the globe. (STIKO) am Robert Koch-Institut. Epi Bull. 3. Centers for Disease Control and Prevention. 14. Clin Sports Med. 2007;26:425–31. book:course textbook. 12th ed. ; 2012. 31. Cochrane Database Syst Rev. 35. Popul Health Metr. 2013;11:17.